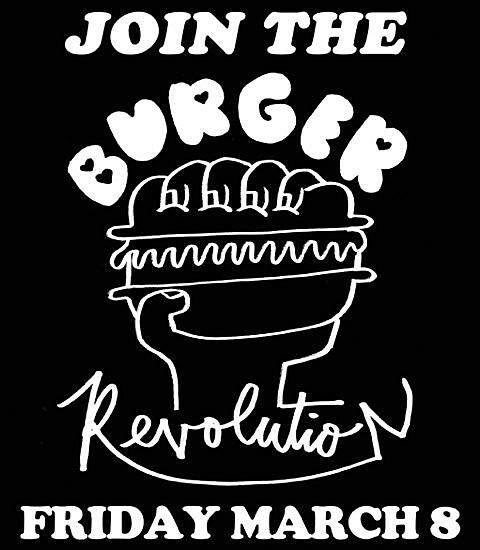 Fullerton, CA record store/label Burger Records is looking to overthrow the powers that be on Friday (3/8) with Burger Revolution, a series of sponsored shows all over the globe. (Though mostly North America and Europe.) Here in New York City, Burger Revolution is going down at Death by Audio with Pop Zeus, Hector’s Pets (who just played with Vietnam), A Rex & J Rex, and La Rosas. Tickets are $8 at the door. Meanwhile, if you’re going to Austin for SXSW, Burger is throwing a killer free show on March 13 at Trailer Space Records with Natural Child, Audacity, Shannon & the Clams, Gap Dream and tons more. After SXSW, Burger’s throwing the two-day Burgerama at the Observatory in Santa Anna, CA (March 22 + 23) with a Who’s Who line-up of garage/lo-fi favorites. A full list of Burger Revolution events are below. ADDRESS:3067 St. Claude Ave. New Orleans La. ADDRESS: 10 Wellington Quay, Dublin 2. ADDRESS: Golden Pin Lanes 1010 W. miracle mile, Tucson,AZ. BANDS: Three hours of Burger bands!